regarding modifying the recipients in a threaded email. How you can edit the recipients in Inbox does not seem obvious when replying to a message with multiple recipients. There are essentially two ways you can accomplish this. First, click on the reply all section at the bottom of the message in your inbox. From there click the little drop down to the right of the recipient list. 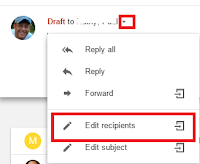 You will be prompted with a menu to change the reply, edit subject, or edit recipients. Choosing Edit Recipients will then popout the reply. Here you can now add more recipients or click the x next to the recipients you want removed. The second way is to click on the reply all section and then select the pop-out icon over to the right. There you can start editing the recipients as mentioned above. On mobile, its a bit different. Tap on reply all and you will see a little up arrow to the right of the recipients. Tap on that and it will open a bigger reply where you can edit the recipients. Quick and simple, but maybe not as obvious as it should be. Hope you found this helpful.